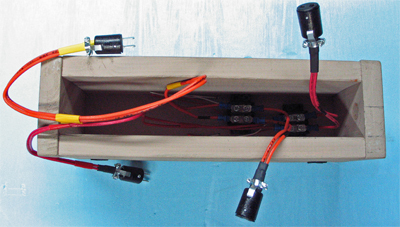 Our one-foot-long module can be used to fill in the odd gap in the display when needed. At other times, it is handy for showing people the basic parts of a standard module. 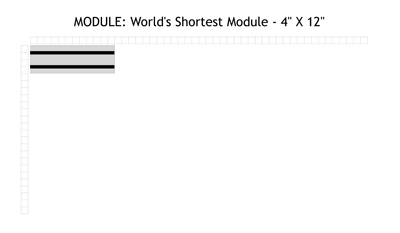 We aren't sure if it is really the world's shortest module, but it is the shortest one we have ever seen. Regarless of its "world record" status, when there is a one-foot gap in the display, this module is exactly the right size! Our one-foot-long module can be used to fill in the odd gap in the display when needed. At other times, it is handy for showing people the basic parts of a standard module. For example, the tracks start four and a half inches from each end of the module, which allows us to use nine-inch snap-track sections to bridge the gaps between modules. The bottom of the module shows the connecting wires, plugs, and terminal blocks that all the modules have. Those thinner, red and white wires feed the power up to the rails on top of the module. The only thing this module doesn't have that most of them do have is a set of legs. Being such a small module, there is no room for them.